Everyone has their preferred methods for working out. However, when it comes to purchasing the best equipment that guarantees to keep you fit and healthy right in the comfort of your home, nothing beats the modern indoor fitness equipment. This review looks into 4 top stationary bikes that you can consider for your indoor exercising. Can also partner up with a wireless phone or tablet. Features a red flywheel guard. The Keiser M3i Indoor Cycle is a new groundbreaking stationary bike that delivers an exceptionally smooth and quiet workout. It’s highly durable and virtually maintenance free. And a backlit computer display that indicates distance covered RPM, pulse, time, as well as a bottle water holder. In other words, it’s one piece of fitness equipment you can’t afford to miss in your indoor workout arsenal. Whether you want to perform a cardio or a high-intensity interval training (HIIT), the Keiser M3i Indoor Cycle can deliver all the health and fitness benefits that comes with riding a bike outdoors for a longer time. Besides, if you love exercising in groups, the Keiser M3i computer can easily project the data onto a display. Besides, with the GoInd app, users can easily download data from the computer to their tablets or smart phones. Why would you want to use the Keiser M3i Cycle? Comfort – Keiser M3i Indoor Cycle provides an excellent and comfortable cycling experience.For example, the seat and handlebars can easily and quickly be adjusted with a unique pull-pin system unlike other cycles. Also, the four-grip position handlebars are great for utilizing different riding positions. Resistance – One of the best features of the Keiser M3 Indoor Cycle is the eddy current resistance system which offers an infinite amount of adjustable resistance. That means whether you a pro athlete or a beginner you’ll always find a resistance level that you would love to work with. Maintenance Free – The Keiser M3 Indoor Cycle is a product of highly innovative design. It was designed to be virtually maintenance free and thus doesn’t come with any labor warranty. That’s means you won’t have to suffer migraine inducing experiences if you happen to run into any problem with your bike. Warranty – Keiser M3 Indoor Cycle comes with a 6-month wearable parts and a 3-year all inclusive. User Reviews – The bike has been has been very well received by users. We are talking about rave reviews from both publications and users around the globe. So far the bike has over 50 reviews on the Amazon retail store averaging 4.5 out of 5. Most of the users have liked its smoothness and quietness when in operation, quality of the computer monitor, durability and comfort as its strong points. Click here for more Keiser M3 Indoor Cycle Reviews. GoInd App – You can use the bike with the GoInd App to track and record performance. Quiet, Smooth Ride – Now you can use the bike anywhere without annoying other people or waking up the neighbors. Doesn’t have a place where you can book or plug in your MP3 player. Only works well with the GoInd App. Information cannot be uploaded to other types of fitness apps. M3 Indoor Cycle may not be suitable for every user – especially those who love bikes with bells, whistles and other high-tech features. However, the bike is a perfect indoor training bicycle for those love highly durable, maintenance-free bikes and effortless efficiency. If you want to purchase your Keiser M3 Indoor Cycle, you can order it by clicking through this link. (Link to Amazon). Reviewed as a best buy in its price range. Heavy 48 lb. Flywheel for smooth resistance. Offers multi seat and handlebar adjustments. Vibrant, easy to view console. Comfortable ergonomic padded saddle for long distance training. The Sole Fitness SB700 exercise bike is another top-of-the-range, commercial quality spin bike specifically made for use in the home as well as in the gym. The bike offers a cycling experience in a way that feels like and offers the benefits of natural outdoor riding experience.You can’t go wrong with this one. The bike features a heavy flywheel for road-feel and a lifetime frame warranty. The pedals come with toe straps to enhance safety by eliminating slips while riding. Several accidents happen when you slip in high-speed cycling.Just like the Keiser M3i, the Fitness SB700 Bike has both adjustable seat and handle for increased comfort. Users can easily vary the height of the handlebars and the position of the seat – up, down, forward and backward. This offers more flexibility and health benefits to the rider especially those with joint problems. We managed to put down some of the features that make this bike one of the go to indoor workout equipment. Here is why we think you can’t go wrong with this bike. Higher Resistance Heavy Flywheel- The Sole Fitness SB700 48lb. flywheel offers great resistance while at the same time ensures smooth and quiet cycling. Besides, the Sole Fitness SB700 bike contains a tension control knob which makes it possible for the user to vary the levels of resistance depending on your fitness goals and comfort. Bottler Holder – It has bottle holders in place to keep you hydrated through your exercise session. The Backlit LCD Console Display – Which displays your speed, distance covered, RPM, and the time spent on the pedals. This way, you are able to track your performance throughout the exercise session. Heart Rate Wire Receiver – You can use both the wrist and the chest strap with the bike to help in monitoring your heart performance. You can always try to work out using different resistance levels, duration and speed. 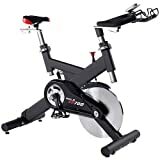 User Reviews – With over 133 customer reviews averaging 4.1 out of 5 on the Amazon, The Sole Fitness SB700 bike must be one of the most celebrated stationary bikes. Most users like its smooth operation and the comfort it offers. Others like the road-feel associated with the bike. However, one or two individuals have had issues with the bike when it comes to connecting up their own heart rate monitors to the console. The bike uses frictional resistance brake pad which slowly wears out with time and requires frequent replacement. The bike is very heavy and carrying it over a long distance might be a great challenge. The bike’s handlebars are not high enough making the tall users to always bang their knees. The Sole Fitness SB700 bike is suitable for daily fitness training. If you are looking for highly versatile, durable training equipment, you can consider purchasing this bike. 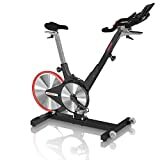 If you are interested in purchasing the Sole Fitness SB700 exercise bike, you can order it online through this link (link to Amazon.com). Indoor cycling bike with 40-pound flywheel. Fully adjustable seat and handlebars for comfort. The left pedal needs to be screwed in counter clockwise. Now, if you are looking for an affordable yet highly performing spin bike, then you may want try the Sunny Health & Fitness Pro Indoor Cycling Bike. The bike is lightweight with a compact frame ideal for family exercises especially when there is no enough space for the exercise equipment. Besides, it’s professional high quality workout equipment with stripped down functionality that makes your exercising hustle free. The bike offers pedals with toe straps to enhance safety by eliminating slips while riding. Several accidents come about when you slip in high-speed cycling. It also has brake pads in place to when you have to make an immediate stop. Both the seat and the handle are easily adjustable to fit the body size and height of the user. Besides, the bottle holder ensures that you can always keep hydrated throughout your exercise session. The backlit LCD console display enables you to monitor your speed, distance covered, RPM, and the time spent on the pedals. This way, you are able to track your performance throughout the exercise session. Sunny Health and Fitness Pro also comes with the pedal straps and toe clips that go over your feet to avoid accidental slip ups. You can always replace the pedals with any other brand that you prefer to achieve great functionality. Effective Yet Affordable – The Sunny Health and Fitness Pro bike is a good bargain since it offers benefits of quality exercise equipment at affordable price. In case you are on a tight budget, you can consider this stationary bike for your fitness training. Strong Frame – Its built quality is the Sunny Health and Fitness Pro bike’s biggest feature. It is a sturdy and strong bike capable of lasting for a very long time when compared to other types of indoor exercise bikes. Comfort – It’s easily adjustable seat and handlers make it easy for the user to customize it to fit their immediate needs. Besides, the heavy duty 40-lb flywheel, smooth chain drive and heavy duty crank combined provide a relatively quiet and comfortable workout. Easy to Assemble – Anyone can assemble the bike as per the instructions in the user manual. Essentially, it won’t take you long. The bike has been partly assembled. A maximum of twenty to thirty minutes should be sufficient. You cannot connect the bike to a fitness app. There is no LCD display. The seat is little uncomfortable but it can easily be replaced with a comfortable one if need be. Its chain drive is not highly durable and can be noisy. You can order your Sunny Health and Fitness Pro bike by clicking through this link. Fully adjustable seat and handlebar. Heavy duty steel frame with a 49lbs flywheel. Belt drive mechanism for smooth and quiet workouts. Adjustable resistance with a press down brake system. The Sunny Health & Fitness Indoor Cycle Trainer is 49-pound flywheel bike ideal for a family fitness program. The bike supports 275 pounds and can be used by anyone at home – even if they are overweight. The 49 pound flywheel stimulates outdoor cycling experience thus making the workout more interesting. The bikes heavy duty steel frame enables it to handle weights of up to 275 pounds. The frame is designed to last for years. Its seats and handles are adjustable and provide a variety of comfortable seating options. Both the front and rear stabilizers to ensure riders do not topple over. Solid Crank – Its heavy duty frame enables it to withstand constant abuse over several kilometers of cycling. Heavy Flywheel – The bike’s 49-lbs flywheel ensures smooth operation during the workouts. Its heavy weight makes the bike stable especially when making fast cycling movements. Good Braking System – The press down breaking system makes it easy to break if need be. Comfort – The adjustable seats and handlebar offers the user a great deal of comfort. You can easily adjust the seat or the handlers to a position that makes you feel more comfortable. Quality Pedals -The bike comes with a comfortable foot straps and toe clips that enhance your comfort and safety. Drive Belt Mechanism – The bike uses a belt drive mechanism that ensures smooth and quiet workouts. Adjustment of handlebar is limited to vertical movement. If you are looking to own the Sunny Health & Fitness Indoor Cycle Trainer – 49 lb. Flywheel, click here to order it from the Amazon.